At this time of year, everyone is talking about back-to-school foods and lunches and are packing up their picnic gear and beach chairs. So I'm packing up my summer salads. Fear not. Fall salads are here. This Asian Chicken and Soba Noodle Salad is a transitional salad that's refreshing enough to keep you cool on a steamy August afternoon yet substantial enough to fill your belly after a hard day in class. With red bell peppers, sugar snap peas, and peanuts, it's got standard salad crunch and nutrition, but unlike most salads it's got long, slippery, tasty soba noodles that make it so much more. Asian soba noodle salads are like soup, salad, and noodle bowls all rolled into one gloriously healthy and satisfying meal. 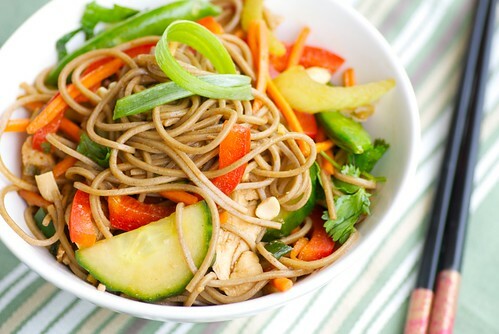 So make this Asian Chicken and Soba Noodle Salad, grab a set of chopsticks, and start twirling and slurping. And be sure to bring leftovers for lunch the next day. It's so much better than a ham and cheese. 2. In a large bowl combine chicken through scallions. 3. In a medium bowl whisk all dressing ingredients. 4. When noodles are cooked, transfer to the bowl with the chicken and vegetables. Add dressing, and toss until well coated. Divide evenly among 4 bowls, and sprinkle each with 1/2 tablespoon peanuts. Garnish with additional sliced scallions if desired. Serve at room temperature or chilled. Shopping Note: Sriracha sauce is a spicy Thai hot chile sauce that can be found in Asian specialty markets as well as the Asian food section of most supermarkets. Susan, this looks very appetizing as well as satisfying. I can't wait to make it!! I have never met an Asian noodle salad I didn't love. I learned to make soba from scratch in Japan, but I've never made it since; the dried noodles available in our Asian market are just too convenient! I love vegetables with soba so I keep a pack of it in the pantry all the time. The crunch of peanuts would be fantastic! Susan, this sounds so tasty! I love soba! One of my favorite noodles to work with. Yum. The first word that comes to mind Susan is "YUM"
It doesn't feel like fall yet to me! But this salad looks so scrumptious, I don't care what time of year it is! dinnersanddreams-Thanks! Hope you enjoy it! lydia-I'm with you! You know how to make soba noodles? That's so cool. abby-Me too! It makes a fast, healthy meal. jessica-I love their chewy texture. tastyeatsathome-I know. I'd eat it 12 mths a year! I like the idea of a transition salad...this way you can still appreciate the coming season while enjoying remnants of the past. This looks and sounds delicious! I love Asian noodle salads. I hate to write this comment, but I have never had soba noodles! This looks so good and easy to make. Will be looking for the noodles so I can give the recipe a try. I have eaten soba noodles at restaurants but haven't made them at home. Our markets don't have a lot of Asian foods. Maybe I can buy them online? It's look wonderful! I love using Asian flavors too. Like the idea of noodle and vegetable salad. Sounds delicious. I love anything asian - especially with lots of veggies and noodles. So this is perfect. I love the idea of a 'transitional' salad! I am so not ready to let go of summer, but this sounds super yummy! With summer just round the corner salads like this inspire me to start planning for long warm evenings eating Al Fresco. this looks lovelie! quick question about soba noodles- do u cook them like u would pasta and leave them al dente or how does that work with those types of noodles? anonymous-Yes, if you can't find them at your market, then try an Asian market or online. Good luck! foodalogue-So glad you like it. ramblingtart-And they're so good for you too! sarah-Me too. Whenever I'm not sure what I feel like having, Asian always sounds just right. basilbee-Yes, I cook them al dente. I say to follow the pkge instructions, since different brands rec different cooking times. Hope you try them! I'm in love..... I'm suddenly craving this salad big time! Just found your blog and am already a fan! Tried it right away - was absolutely delicious. Five stars from me. Cheers for sharing this lovely recipe. chelsea-Ooh, I'm so glad to hear it! maixblue-Lovely! Thanks for letting me know.